This is a very nice geometry puzzle taken from the Mathematical Circus, by Martin Gardner. The puzzle is originally devised by Kobon Fujimura, a leading puzzler from Japan. 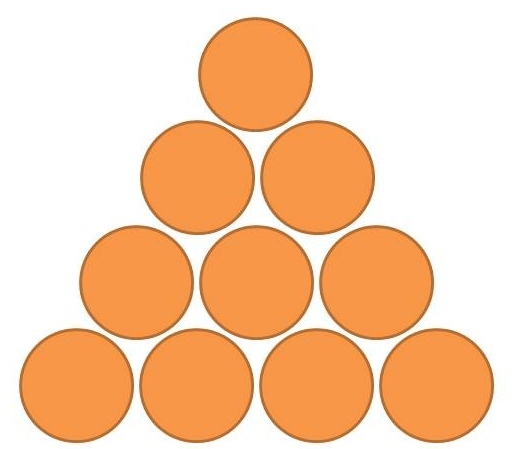 Look at the figure below which has 10 coins arranged as an equilateral triangle. What is the smallest number of coins you must remove so that no equilateral triangle, of any size, will have its three corners marked by the centers of the coins that remain? As a hint, there is only one correct answer, excluding rotations and reflections of the same answers. For children, please first try this with three coins, then with six and then with 10, it will also help them realize that to solve a bigger problem, they might first want to solve a smaller problem. As always, please send the answers directly to me at alokgoyal_2001@yahoo.com and share it with others through your facebook/ linkedin in case you liked the puzzle.